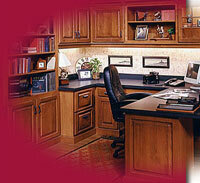 DeWils fine cabinetry has been crafted especially for you since 1959. Carrying three different style of cabinetry, which includes Traditional, European frameless, and Inset door style. DeWils has Custom style cabinetry with plywood construction and a variety of choices. Choose from a palette of stain colors, furniture glazes, wood species and door styles, with the hundreds of combinations DeWils has to offer-you are sure to find the perfect color, style and look for your project.